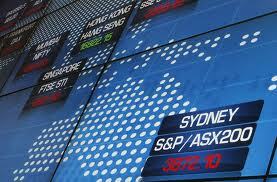 The Australian stock market closed to half percent lower due to the weakness amongst the industrial and bank stocks. Gold price benefited from the week US dollar causing the revival for Newcrest Mining, which lifted by $1.04 to $15.60. Commonwealth Bank dived $1.01 to $72.48, ANZ oppressed 59 cents to $29.64, and Westpac slipped 31 cents to $31.48 and the National Australia Bank lost 28 cents to $33.09 were among the major banks. After the Reserve Bank of Australia released May 7 board meeting minutes where the cash rate was reduced the lowest record of 2.75%, the market moved higher. "That's probably not helping our market, those comments by the Reserve Bank today saying they're not looking for any sort of real strong growth until later next year," said RBS Morgans Ipswich manager Tony Russell at the May 7 board meeting . According to the minutes released, the RBA said the economy was yet to grow a below-average growth for the rest of the year 2013. The Mining stock slipped, with BHP Billiton losing 14 cents to $34.65 while Rio Tinto fell 62 cents to $54.80. In Sydney, the price of gold closed at $US 1,394.15 per ounce, up $US48.08 from $US1, 346.07 on Monday. The Resources engineering group Transfield services shares fell to a record low after the cut in over 100 jobs. The shares were down to 27.5 cents to $1.00 this afternoon.